CASTLETON—Honoring students who served their country, a ceremony was held at Castleton University April 24, inducting 10 undergraduates into the Castleton chapter of the SALUTE Veterans Honor Society. SALUTE is the only national honor society highlighting the achievements of student veterans. SALUTE membership recognizes their commitment to academic excellence, high principles and superior achievements throughout their lifetimes, and is dedicated to service, academics, leadership, unity, tribute and excellence. Inducted students include: Ashley Antoniak ‘20, Robert Bacon ‘20, Eric Baurle ‘18, Tina Bennett ‘18, Mariah Clark ‘17, Deborah Connors ‘20, Gonyaw ‘20, Nikolaus Houghton ‘17, Christopher Merrill ‘20, and Kathleen Thompson ‘17. For more information visit castleton.edu. 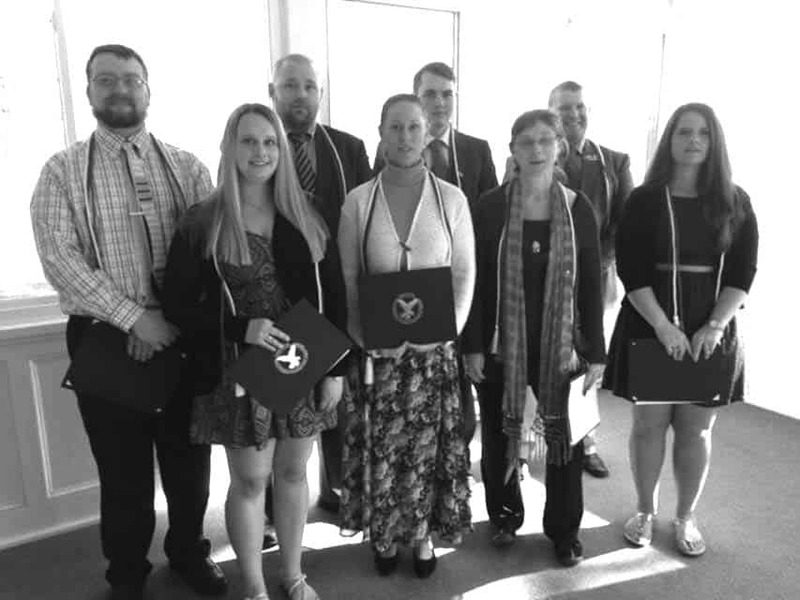 Ten undergraduate veterans were recognized in their induction to the Castleton chapter of the SALUTE Veterans Honor Society.